Parametric insurance, or index-based insurance, pays out benefits based on a pre-determined index for the loss of assets and investments as a result of weather or other catastrophic events. In contrast, traditional insurance relies on assessments of the actual damage. SCOR further elaborates on the matter by describing an insurance or derivative product with a payout structure that does not solely depend on protection buyer’s incurred loss but rather is linked to an externally observable variable or index (e.g. weather, market loss, prices). The main advantage of parametric solutions is the speed of pay-out, as the objective of this type of mechanism is to provide the most efficient calculation of a pay-out and lowering the dispute risk. It is commonly advised to place parametric cover as a natural complement to a traditional insurance programme. Though the insurance market continues to evolve, key challenges remain. The protection gap: Over 90% of emerging Asian catastrophe losses are uninsured, earthquake losses are largely uninsured worldwide and the insurance gap is continuously increasing over time. The evolution of the corporate risk landscape: business interruption remains the main concern for many risk managers and the speed of settlement and the clarity of triggers are still a concern. The rise of digital and the Internet of Things: an estimated 20 billion connected devices in the world by 2020 are enabling an increase of pricing precision instant selling, faster settlements and lower costs. 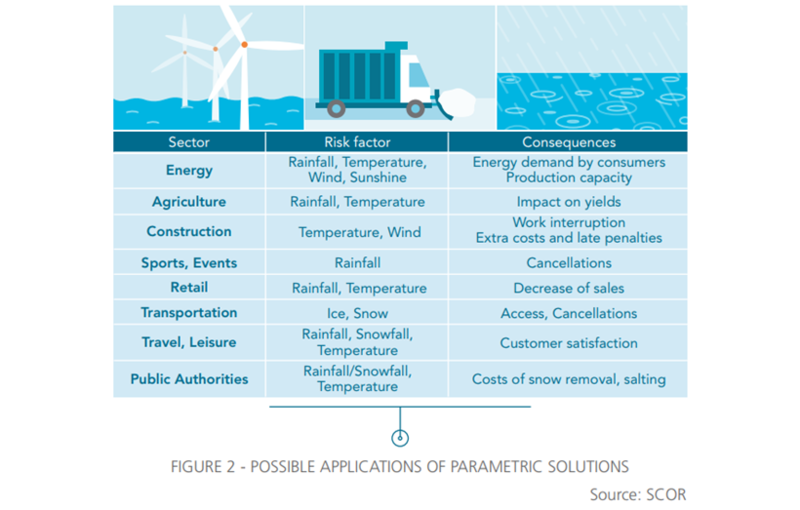 Historically, parametric products - whether they are pure weather-derivative or commodity-weather combined - were developed by energy companies. However, combination products have also been launched, with a dual trigger of natural event and damage observed on the insured assets. A field of parametric insurance has been developed for corporate entities that are affected by events not directly damaging their assets but creating a business interruption or activity loss. In that respect, certain payouts based on the number of days of factory closure have been an interesting addition to traditional programmes. Solutions based on a fixed pay-out in case of observed data (weather or non-weather, Cat or non-Cat) have been developed. This trend is of note as it is not solely related to corporate clients, but equally public authority entities, SMEs and individuals. The difference between the ultimate net loss of a claim and the actual payout of the index is referred to as the basis risk. There are cases of negative basis risk, where the parametric payment is lower than the ultimate net loss encountered by insured, and of positive basis risk, where the payments exceed the ultimate net loss suffered. Basis risk is managed by optimization algorithms and the combination of extensive use of available data sources and experience on the perils. To learn more about the case studies, read the publication here. Vincent Foucart is a graduate of ENSTA (École Nationale Supérieure de Techniques Avancées), HEC (Ecole des Hautes Etudes Commerciales) and CHEA (Centre des Hautes Études de l’Assurance). He is also a Certified Financial Analyst and Actuary. He began his career at Société Générale in Asia, before joining the Allianz group in 2001 as an Investor Relations Officer. In addition to his functions he took on the management of the AGF Chairman’s Office, adding the management of the long-term investments portfolio in 2006. In 2007, he became Managing Director of the asset management company Tocqueville Finance. He joined SCOR in 2009 as Manager of the Chairman’s Office, before taking on the role of Group General Secretary. More recently, he contributed to the development of ILS Strategies for SCOR and in May 2014 took over the Alternative Solutions Specialty Line, acting as CUO. Since 2018, he has served as the SCOR employee representative director on SCOR SE’s Board of Director. He was appointed Deputy CEO of P&C Partners at SCOR, in charge of Alternative Solutions & Technical Development in 2018.